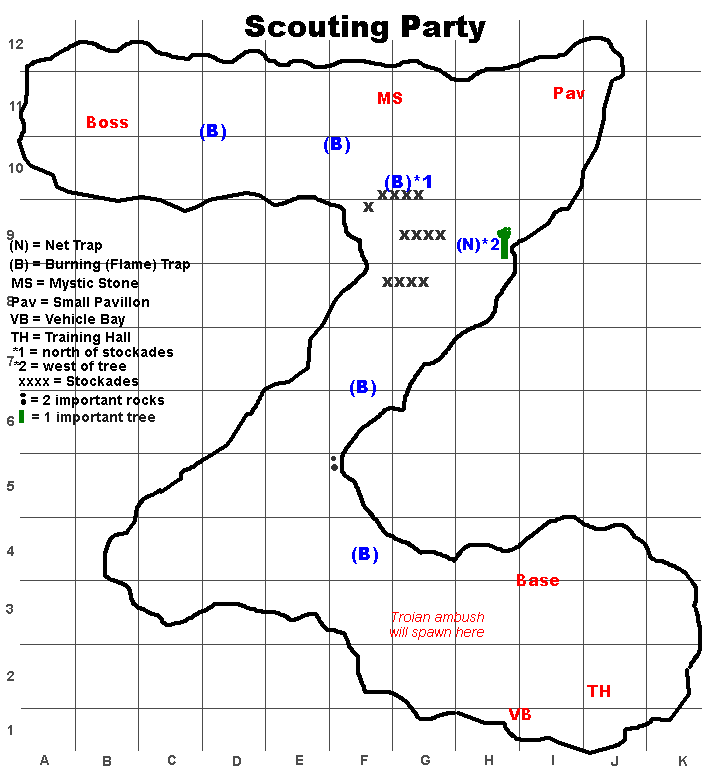 This is the very revamped version of the earlier article about “Scouting Party”, a Troy mission. In the first version I played through this mission with my trusted lvl 140 party. Now I have levelled up another character and did the mission twice with my musician main (lvl 65), my witch (lvl 6x) and my shaman (lvl 6x). They are clad in partly Walachia, partly Gilgamesh equipment – nothing fancy though. That should give a more realistic impression – and sure it did, at least to me. 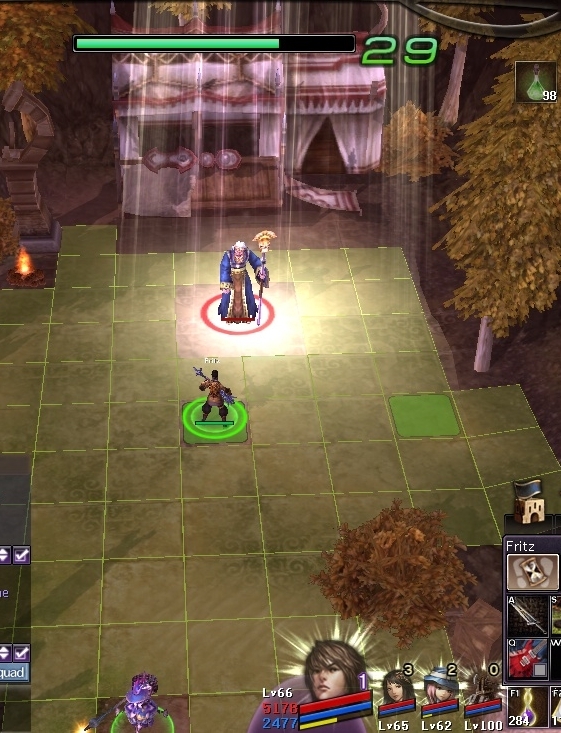 You will probably tackle this mission while you are fairly new to the wonderful world of TBS. I therefore recommend reading my basic guide for TBS missions now (if you haven’t done it already). I won’t repeat any pearls of wisdom here that I have already strewn out in this guide. 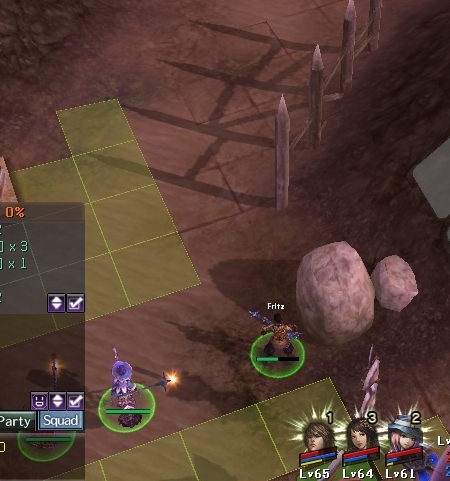 The mission is short in three ways: You can do it very fast, even in lvl 60ish, the map is very small and you can fail very fast. If you know how to do it it is very, very easy. Any misstep will be punished by death, and it is not too difficult to fail. This mission is ideal to train using your witch. But there is one huge caveat: your witch must be upgraded once. A witch who has not the level 20 upgrade (“High Witch”, costs you 50 redemption crystals) does not meteor strike with a 5×5 area but with a kind of prolonged cross. Don’t ask how the cross exactly looks like. It is completely uninteresting and vastly inferior to the real meteor strike, so grade your witch up before you tackle this mission. That said it would be possible to do the mission even with an un-upgraded witch. 1. Because there is no summon portal you can and should upgrade all the way through right at the beginning. You remain in your starting position, click on “base material”, click on “end turn” (the shortcut is “^” or for German keyboards: “ö”), and do similar simple tasks until you got all possible upgrades. Oh, and during these turns you should build your catapult, too. a) Skip, until my witch can cast meteor strike. Don’t forget to drink mana if necessary – meteor strike uses up more than half of the mana (of my witch, at least). b) Go forward scouting with my musician main and run into the next trap on purpose. 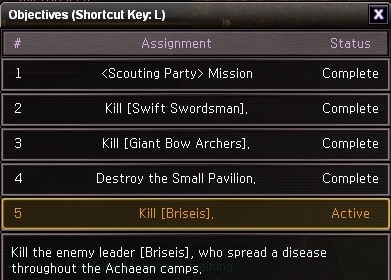 In the level area you want to do Scouting Party you most probably have no scrolls for disarming traps, so you have no other alternative, and I simulated it. “Simulated” because my level 140 main character could have sent scrolls – but that would border on cheating. c) Position your witch so that with the next move she is near enough to the next group of enemies for unleashing her meteor strike. Your shaman stands back, just in case. First “big” monster group, main has just disarmed 1st trap. 3. This works until you get to the three rows of stockades. Here you have to vary the SOID a bit. When you reach the marked row you will trigger an ambush of Troian warriors. Red zone: Only enter when all is ready. a) Move your witch back until she reaches the first corner again. b) Make sure meteor strike is ready to charge. c) Trigger the ambush with your first activation of the current turn. That is important: you get no cut scene, no double turn for you. If your witch can’t cast meteor strike immediately she will be dead meat. d) Meteor strike the enemies. Yay! 4. Now the next target is to destroy the pavillon in the upper right corner marked “Pav” in the map. Right? Wrong. What you do first is: get your witch back to the row of stockades. Get your catapult in position and bomb away at the mystic stone. You do not want to engage the monsters near the pavillon (or to the left of the mystic stone) with the stone still erect. You really don’t. 5. Then do your SOID again on all the mobs near the pavillon. Do not – I repeat: don’t – destroy the pavillon. Destroying the pavillon will trigger the boss to spawn and you don’t want that right now. 6. 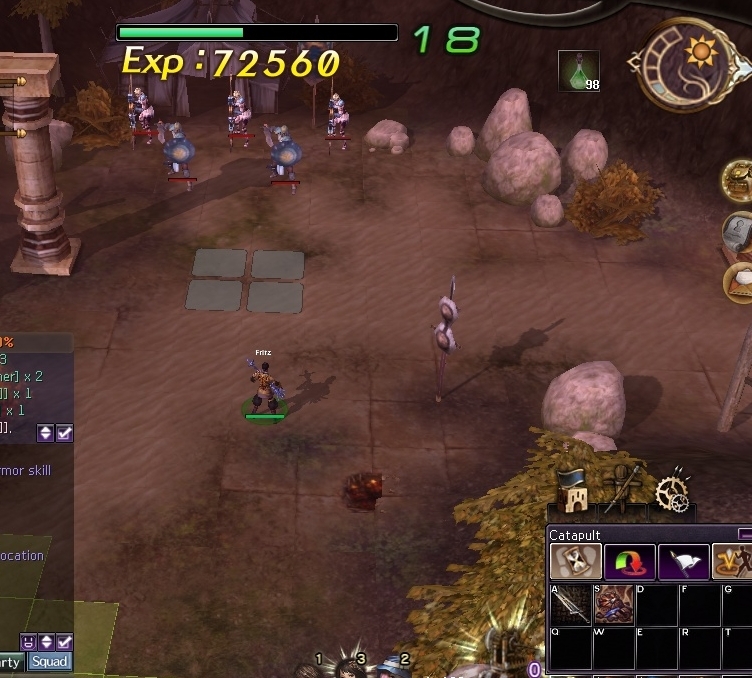 Go forward in direction of the boss area and overcome the two groups of monsters (one left to the mystic stone, one near the very end at the top left of the mission map) with your proven SOID scheme. 7. Then all is empty. No monster alive. Let your catapult destroy the pavillon. Briseis appears. Wham! Meteor strike! She will have something like 30% hp then (at least she had when I ran the mission). Your main stands near Briseis, the witch far away, your shaman even farer away. The picture below illustrates that: you see my witch lurking at the very bottom. She may be a coward but a very meteor-strikey one. If you can’t eat away the last hp of the boss you must do something terribly wrong. But I trust you. You will make it. Beware the traps! Never was a trap map more valuable than here. Especially because you most probably have to disarm the traps the hard way. 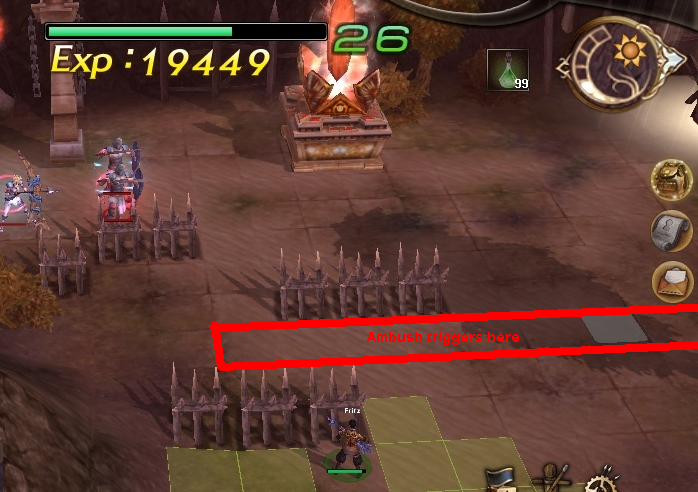 That means your trap disarmer must be far away from the rest of your lot, otherwise all get trapped. And if the enemies got curious already, they will come to investigate with daggers ready to slit your throats. Bring your potions. I brought elixirs because I like to keep things simple. Let your catapult trail behind. In case of emergencies it may be the last “man” standing from your stalwart band, and has to survive until your other toons resurrect at base. Which is not as catastrophic in this mission because the distances in this map are quite short. For your amusement there is a video on youtube which shows how a 10x-formation fares (admittedly not out there to do the ideal run but to show the traps as well). These 10x-toons got really damaged. ← Can’t Throw Away A Quest Item? Sell it! I guess no matter what is your main as long as you know the tricks (thanks to your guide) and how patient you are with the witchy this TBS is really easy to do. I have created an alt account which includes CannonM level 59 and has Shaman lvl 60 and Witch 57. Just soloed this one with my level 50 alt. Gunner, shaman, canon main. Biggest obstacle would be knowing what you’re doing, for which we have this great blog. Second obstacle for a new level 50 would be getting someone in your guild to lend you elixirs, ress scrolls, or whatnot as you can repay them with just one win by selling boxes. 50—->53 is just amazing. and its certainly something that noone suspects the old lady with a skull on her staff who mumbles about people finding the truth about the disease…how could she possibly have been guilty. What program are you using? Fraps? If yes, how do you set it up? Mine makes HUGE files. Yes, I use FRAPS. FRAPS makes huge files and there is (for the time being) no way to avoid it. FRAPS must write the video information down to your hard disk in real time, while you play, and there is simply no time to compress it properly. Making a video is a two-step-process: first FRAPS it, then compress the video files. Personally I use Magix video maker now, but I worked with Windows Live Movie Maker for a long time. The latter program is free, you can download it via Microsoft. Edit: I can’t do that individually. I seem to be able to forbid mailing comments to all users but that would be a bit drastic. I am afraid that you have to do that yourself. That should be possible or so users on the wordpress forum assured me.